September: LAB Choir 2 starts today! Today was the first session this season of Chanticleer's Louis A. Botto (LAB) Choir, led by our Education Director Ben Johns. We started this idea last year, forming the 14 member LAB CHOIR 1 to be the instrument for the sessions we offered the choir directors at our National Youth Choral Festival. 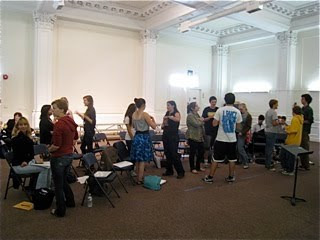 For LAB CHOIR 2, Ben recruited 22 student singers from as far away as Santa Rosa and Davis, as well as San Francisco and the East Bay. 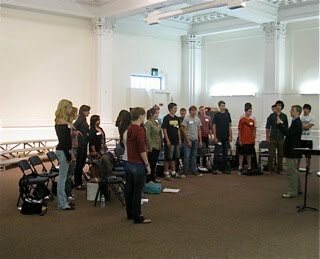 It's something we've thought about for a long time; it's seems a natural for us to expand upon our education offerings with an after-school program for advanced singers. 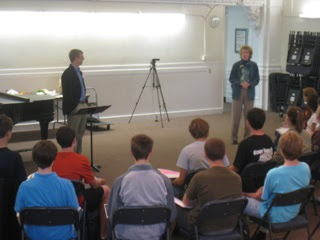 There will be three 10 week sessions during the school year, each with up to 25 singers participating. They will rehearse every weekend and perform at schools, community centers -wherever they decide to. 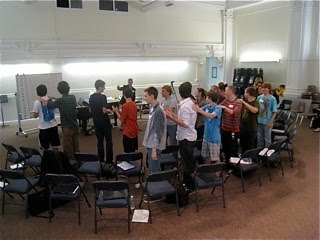 They will be able to attend a Chanticleer rehearsal, have input from the ensemble, and see Chanticleer in concert. 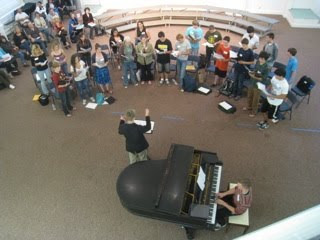 LAB CHOIR 2 will make its debut at our Youth Choral Festival on October 22. We thank all the parents who came along for their support, and we thank the singers for singing up for this adventure with Chanticleer. Today's session started with a sing through of "Sure on this shining night" - as Ben said -"just to see what we sound like." The four hour session included a greeting from Chanticleer Board Chair Kathy Henschel, warm-ups, snacks, discussing the schedule, getting acquainted, and a lot of serious singing. They'll meet again Saturday and Sunday and Monday for 6 hours each day. That's the whole Labor Day weekend - a very impressive commitment! We can't wait to hear them.